Designed to keep up with life’s thrills and spills, the Boom 3 is the latest in Ultimate Ears’ line of best selling portable speakers, and it comes with an incredible IP67 waterproof and dust-proof rating, which means it can be submerged underwater for up to 30 minutes. The UE Boom 3 is available to buy for $129.99 (£129.99 / AU$199.95), which is around $30 more expensive than its predecessor, the UE Boom 2. This price puts the Boom 3 at the more expensive end of the portable speaker market – more expensive than the Bose SoundLink Color II, which offers a higher standard of audio quality, but a lower IP rating. Like the UE Boom 1 and 2, the newest model in the portable speaker line has a cylindrical build for 360 sound, and with a height of around 18cm, it’s pleasingly compact and easy to hold on the go. The UE Boom 3 comes in range of two-tone iridescent fabric finishes, including sunset red, lagoon blue, forest green, and night black. We tried out the forest green design, which features a two-tone khaki and gold fabric finish, which shimmers beautifully when it catches the light. This particular color palette may not be for everyone, but with so many options on the Ultimate Ears website, even the fussiest customer is sure to find a combination they like. Aside from looking great, this fabric is designed to be super durable, as it was originally engineered for motorcycle jackets and fire equipment. The calling card of the UE Boom 3 is it’s incredible waterproof rating, which means it can be totally submerged in water for up to 30 minutes thanks to a super tight interlocking weave and a fully protected charging port. If you plan on taking the Boom 3 into the pool for a dip, it also floats – although for most of us, the waterproof rating will prove most useful in the shower. On the top of the speaker you have an on/off button and a ‘magic button’, which can be used to pause, play, and skips tracks. You can also used the magic button to directly access your playlists from a select few music providers – to do this you will need to set this feature up in the accompanying Megaboom app. Disappointingly, this feature only works with Apple Music if you’re on an iOS device, and Deezer Premium if you’re an Android user – with so many Spotify users out there, the experience would really be improved with Spotify integration. The rubber casing that housed the buttons on the UE Boom 2 is gone, with the large ‘+’ and ‘-’ volume buttons integrated directly into the fabric grille. While this looks far more aesthetically pleasing, it does make the volume buttons a little harder to push down, particularly if you’re using the speaker in the shower. With a maximum volume of 90 decibels, this little speaker certainly packs a punch, and it has a two 2-inch drivers and two 4-inch passive radiators for room-filling sound. The conical design allows for 360 degree audio, and we found the sound to be spacious, with good frequency separation. Although bass frequencies sound good (if not lacking in a little depth) for the speaker’s size, we weren’t blown away by the mid frequencies, which feature heavily in vocals and keys – they felt slightly subdued in comparison to the bass. Treble frequencies had the same problem, with a generally lack of clarity in the top notes – we tried out guitar heavy tracks like Belle and Sebastian’s ‘Your Cover’s Blown’ and we felt that the highest frequencies could have benefitted from a sharper kick. If you are unhappy with the default equalizer settings, you can amend them in the dedicated app – it comes with four different presets ‘The Standard’, ‘Cramped Spaces’, ‘Voices’, and ‘Bass Jump’. Swapping between these presets didn’t have a huge effect on the audio output, although you can create your own custom equalizer settings with the adjustable tuner – simply move the sliders up and down on the bass, mid, and treble tuners until you find a sound you’re happy with. One cool feature of the app is that you can link up two UE Boom 3s for stereo sound – although it’s possible to link up to 150 Boom and Megaboom speakers for an crazy wall of sound. To charge the UE Boom 3, you can either connect it to a power source via the included micro-USB, or use Ultimate Ears’ own charging dock, which gives you a couple of different options depending on whether you’re on the go or listening at home. 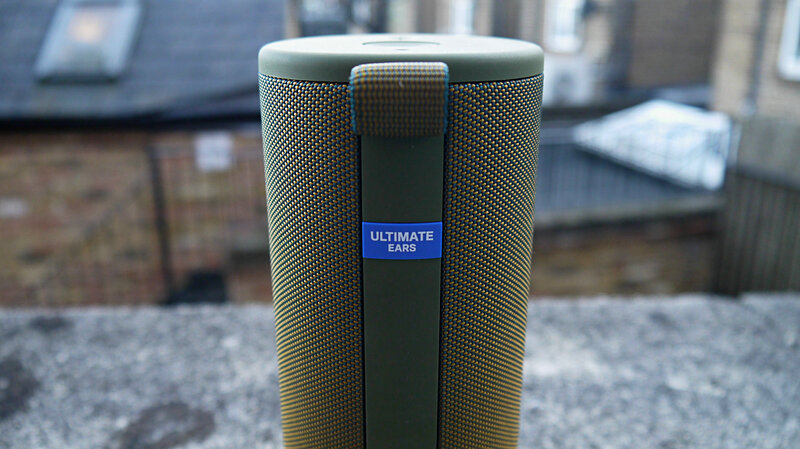 In terms of portability, the speaker ticks all the right boxes: it’s light, easy to carry, and has an impressive 15 hours of playback from a single charge. We encountered no problems with the Bluetooth connectivity either, and found its stated range of 150 feet to be pretty accurate. The waterproof design seems to work well, and we encountered no problems when using it in the shower. 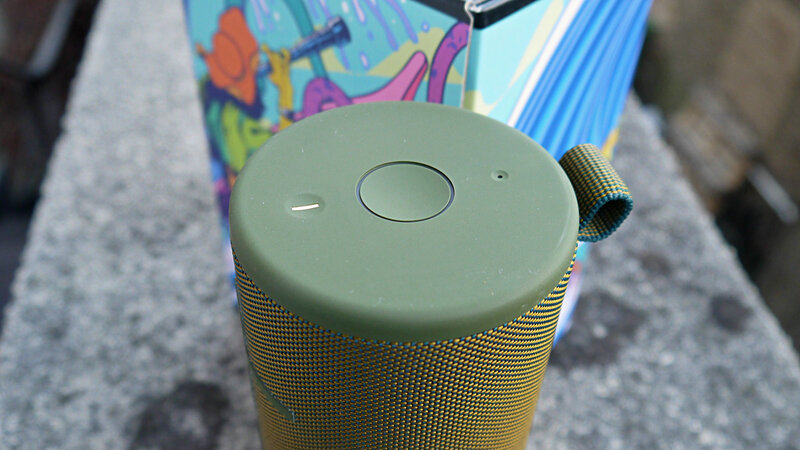 It also has a fabric hook on the top of the speaker so you can hang it up while you wash.
All in all, the UE Boom 3 is a solid little speaker that addresses some of the issues of its predecessor, the UE Boom 2. 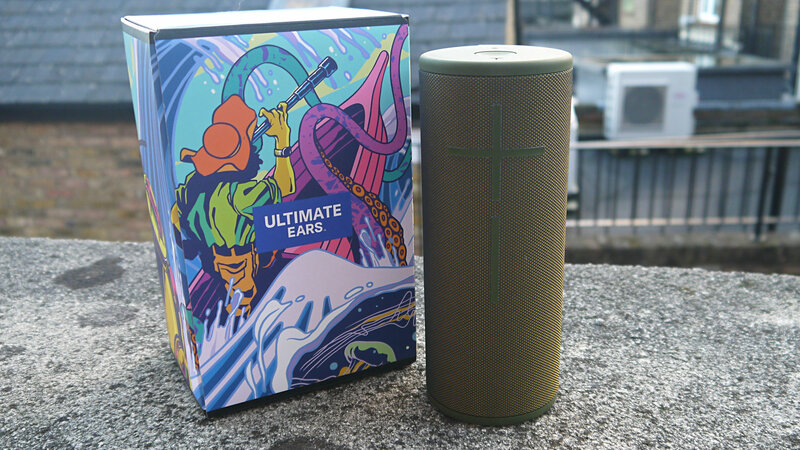 With a wireless range increase of 15 feet, and increased waterproofing, it’s certainly an improvement on the previous generation, but Ultimate Ears still haven’t quite achieved perfection in the UE Boom 3. At this price, it’s puzzling that Ultimate Ears haven’t made an significant improvements to the audio quality which, while powerful, is lacking clarity and precision, particularly in the lower mids and treble frequencies. Having the ability to change the equalizer settings is a nice touch however. Battery life has also stayed the same between the generations at 15 hours, which seems a little low compared to the UE Megaboom 3’s 20 hours. Still, the Megaboom 3 is a fair bit more expensive, so if you’re looking to save some cash on a portable speaker, go for the Boom 3.